Long noncoding RNAs (lncRNAs) represent the RNAs that have a size of >200 nucleotides and lack the capability of protein-coding. Although lncRNAs are among one of the least well-understood molecules, emerging studies have revealed that lncRNAs play critical roles in a broad range of biological processes and are associated with a number of diseases, i.e. cancer, cardiovascular disease, and neurodegeneration disease. LncRNAs are becoming critically important for the understanding of life sciences, especially diseases. The LncRNADisease database is not only a resource that curated the experimentally supported lncRNA-disease association data but also a platform that integrated tool(s) for predicting novel lncRNA-disease associatons. In addition, LncRNADisease also curated lncRNA interactions in various levels, including protein, RNA, miRNA, and DNA. -submit new entries to the lncRNADisease database. -develop more tools for predicting novel associations of lncRNAs and diseases. Current version of LncRNADisease database integrated near 3000 lncRNA-disease entries and 475 lncRNA interaction entries, including 914 lncRNAs and 329 diseases from ~2000 publications. LncRNADisease also provided the predicted associated diseases of 1564 human lncRNAs. LncRNADisease v2.0: the new version of LncRNADisease. lncRNAdb: a reference database for long noncoding RNAs. 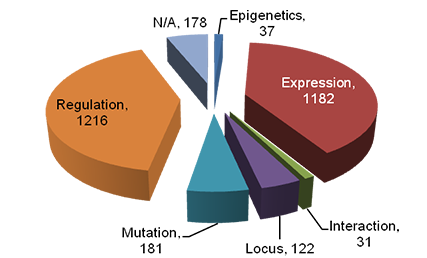 NRED: a database of long noncoding RNA expression. NONCODE: an integrated knowledge database of non-coding RNAs. HMDD: a human microRNA disease database. OMIM: a database of human genes and genetic disorders. GAD: a Genetic Association Database. January-8, 2019, the new version of LncRNADisease (LncRNADisease v2.0) was released. July-26, 2017, a major update of LncRNADisease database was released. Current database contains 2947 lncRNA-disease entries with controlled lncRNA and disease nomenclature. Data of both current version (July 2017) and the previous version (Jun 2015) can be downloaded from here. Jun-2, 2015, the database was updated with 74 lncRNA-disease entries. Jun-11, 2014, the database was updated with 267 lncRNA-disease entries. Jan-18, 2014, the database was updated with 110 lncRNA-disease entries. Dec-3, 2013, the database was updated with 46 lncRNA-disease entries. Apr-2, 2013, the database was updated with 65 lncRNA-disease entries. Jan-3, 2013, the database was updated with 63 lncRNA-disease entries. Jun-27, 2012, the original LncRNADisease database was released. To browse data in the database, select the menu "Browse". And then select corresponding items to browse the entries you are interested. For example, if you want to get entries about the lncRNA "AK023948", you can click "LncRNA" first and then select "AK023948". The corresponding entries will be shown on the right panel. In the "Search" result, each entry has 11 items. To browse interaction data in the database, select the menu "Interaction". And then select corresponding items to browse the entries you are interested. For example, if you want to get entries about the lncRNA "AF087999", you can click "LncRNA" first and then select "AF087999". The corresponding entries will be shown on the right panel. Currently, lncRNADisease integrated a genomic neighbor based tool for the prediction. To use this tool, the users need to submit the lncRNA name and its genomic information including its chromosome starting position, and ending position (the three items are necessary). When clicking the “Click to Predict” button, the server will return the prediction result. If you want to input a new entry, please click the button of “reset all”. For example, if you have a novel lncRNA named “test”, which locates in the region [84464969, 84466352] in the “-” strand of chromosome 14. You need to first input the above information into corresponding blanks and then click “Click to Predict” button. The prediction result will be shown in the bottom of the page. Besides the genomic information of the lncRNAs, neighbor genes and predicted disease are also given in the result. The experimentally supported lncRNA-disease association data (txt and xls);(Genome builds used for re-mapping in this version: hg38 and mm10; Note also that the gene annotations of lncRNAs with transcript ID like NR_xxxxxxx and ENSxxxxxxx were based on NCBI and Ensembl annotations, respectively.). The gene sequence of lncRNA ( txt ). The RNA sequence of lncRNA ( txt ). The experimentally supported lncRNA-disease association data ( txt and xls ). The experimentally supported lncRNA interaction data ( txt and xls ). The predicted lncRNA-disease association data ( txt ). A list of lncRNAs predicted to be associated with cardiovascular function and disease ( rar ). Tissue specific lincRNAs ( txt ). LincRNAs associated disease predicted by co-expression analysis ( xls ). Welcome to submit new entries to the database. Long noncoding RNAs (lncRNAs) are noncoding RNAs that are >200 bp in length and represent the majority of the human transcriptome. Although lncRNAs normally tend to be less conserved across species and often show low expression levels and high tissue specificity, accumulating studies have shown that lncRNAs have important functions and play critical roles in various biological processes. Therefore, dysfunctions of lncRNAs are associated with a broad range of disease, including cancer, cardiovascular disease, and neurodegeneration disease. lncRNADisease is a resource that curated experimentally supported long noncoding RNAs (RNAs) and disease association data and integrated tools for predicting novel lncRNA-disease associations. 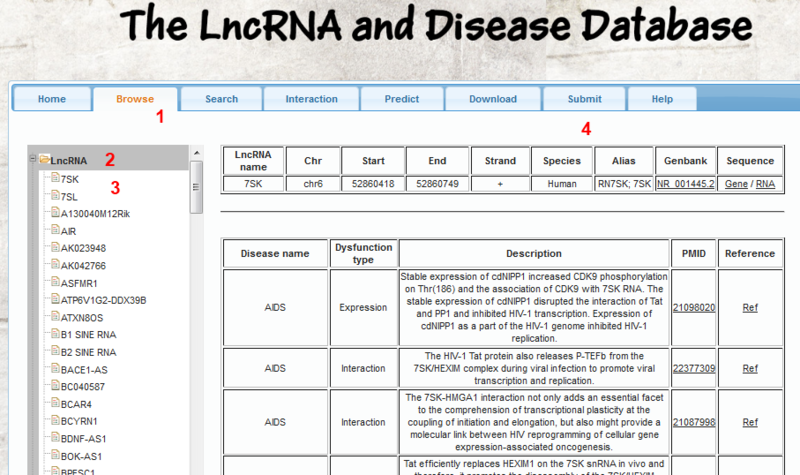 Currently, users can browse and search the database by the names of lncRNAs and disease. Moreover, users can download all data in lncRNADisease, including lncRNA-disease association data, lncRNA interaction data, and the predicted lncRNA-disease association data. In addition, users can use the tool integrated in lncRNADisease to predict potential associated disease for novel lncRNAs. Visiting lncRNADisease: Log on lncRNADisease at http://www.cuilab.cn/lncRNADisease. 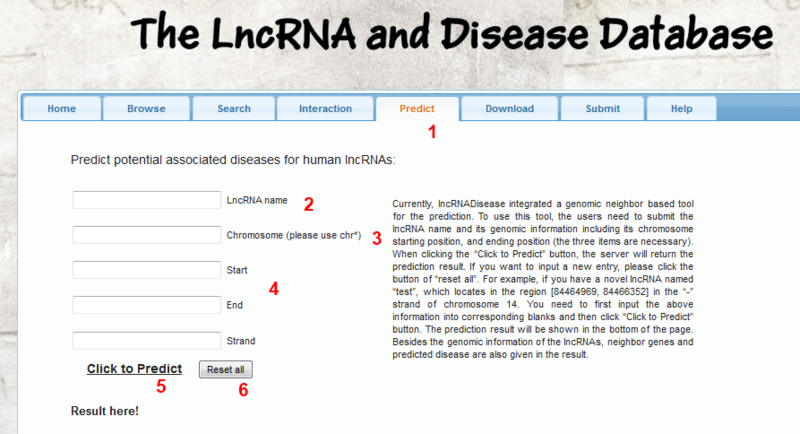 To browse lncRNA-disease association data in the database, please click the menu "Browse" (1 in Figure 1). To browse the entries related to the candidate disease, please click “disease” and select the one you are interested in. To Brose the entries related to the candidate lncRNA, please click “lncRNA” and select the one you are interested in. For example, if you want to get entries about the lncRNA "7SK", you can click "LncRNA" (2 in Figure 1) and then select “7SK” (3 in Figure 1). The corresponding entries will be shown on the right panel (4 in Figure 1). Each entry has eleven items, as follows. (3) Dysfunction type - According to the experimental evidence of the lncRNA and disease associations, we annotated the dysfunctions into the following types. “Expression” indicates that the experimental evidence is from expression data, i.e. up-regulated of the lncRNAs in disease samples. “Mutation” indicates that the experimental evidence is mutation of lncRNAs. “Interaction” means that the experimental evidence is the interaction of lncRNAs with other molecules. “Locus” means that the lncRNAs is a within a disease associated locus. (4) Description - detailed description of the lncRNA-disease association. (5) Chr - the chromosome in which the lncRNA is located. (6) Start - the starting genomic coordinate of the lncRNA. (7) End - the ending genomic coordinate of the lncRNA. (9) Sequence – the DNA and RNA sequences of the lncRNA. (11) Reference – “Ref” links to the reference details including author, title, journal, etc. The PMID links to the reference in PubMed. To search data in the database, select the menu "Search". lncRNADisease provides functions of "search" by full or partial names of lncRNAs or diseases. Input your candidate keywords into corresponding blanks and submit the query. To browse the lncRNA interaction data, select the menu “Interaction” and click the lncRNA name you want to browse. If the users have novel lncRNAs and want to predict the potential disease associated with their lncRNAs, they can click the menu “Predict” (1 in Figure 2). Currently, lncRNADisease integrated a genomic neighbor based tool for the prediction, as shown in Figure 2. The users need to first submit the lncRNA name (2 in Figure 2) and its genomic information such as its chromosome (3 in Figure 2), starting position, and ending position (4 in Figure 2). When clicking the “Click to Predict” button (5 in Figure 2), the server will return the prediction result. If you want to input a new entry, please click the button of “reset all” (6 in Figure 2). To download data in the database, select the menu "Download". lncRNADisease provides two formats of downloadable file in TEXT and Excel formats, respectively. The users can download all data in lncRNADisease, including the experimentally supported lncRNA-disease association data, lncRNA interaction data, and the predicted lncRNA-disease association data. To submit new entries to the database, select the menu "Submit". The users need to input their data into corresponding blanks and then submit the query. We will further curate the submitted information to determine whether to add the new entries to the database or not. Citation: Chen et al., LncRNADisease: a database for long-non-coding RNA-associated diseases. Nucleic Acids Res. 2013 Jan 1;41(D1):D983-6.